This app is used to find out which parcels in a given area are candidates for redevelopment in the short-to-medium term. This can help planners identify the parcels or neighborhoods that are ripe for redevelopment and predict which areas may be more suited for redevelopment at some time in the future. It can also help identify whether redevelopment candidates consist of small parcels or large parcels, and whether they are scattered or concentrated. The app generates a list of redevelopment candidates, but the list requires “ground-truthing” to eliminate from consideration historic, publicly owned, and low-value/high-income-generating properties. The two methods can produce somewhat different results. This is because the depreciation method analyzes the redevelopmen timing for each parcel based on the relationship of building value to land value over the functional life of the building. The bottom quartile method, on the other hand, categorizes all of the parcels in a study area into a user-defined number of quantiles which compares the value to the other parcels. In essence it helps identify the least expensive parcels in an area, which if redevelopment is occuring, are more likely to experience change than the more expensive parcels. The Depreciation Schedule method compares the relationship between building depreciation and land appreciation over time to determine when the building will become worth less than the land it sits on. The time horizon examined is the depreciation schedule associated with different land uses. A table of depreciation periods for number of land uses is included below. Four input variables are required at the parcel level, and are commonly included in tax assessor data. The current land use of the structure on the parcel. This will allow the user to choose an appropriate depreciation period. Effective year built is needed to determine at what year in the depreciation schedule / effective lifespan the building is based on it's use. The other two variables required are the value of the building or structure and the value of the land. With these four attributes at the parcel level it is possible to estimate the year that the building value will fall below the value of the land, which in theory is a decent predictor of redevelopment ripeness. 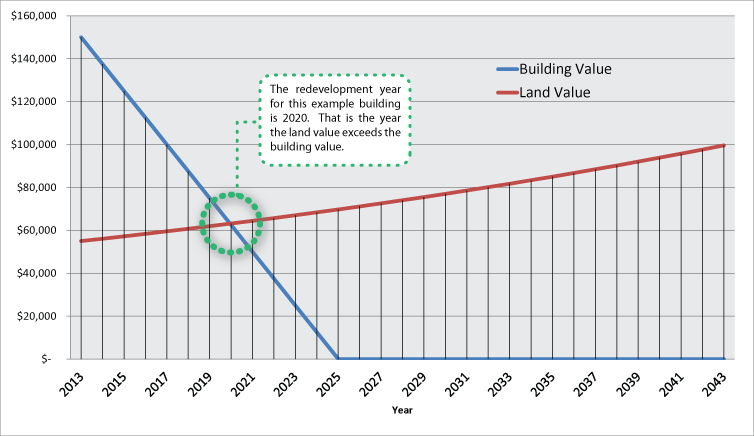 If the Current Year minus Effective Year Built is greater than the Building Lifespan, then the Redevelopment Year is unknown.The result is 0.The building could be historic. If the Current Year minus Effective Year Built is equal to the Building Lifespan, then the Redevelopment Year is the Current Year.Otherwise the equation results in a divide by zero error. 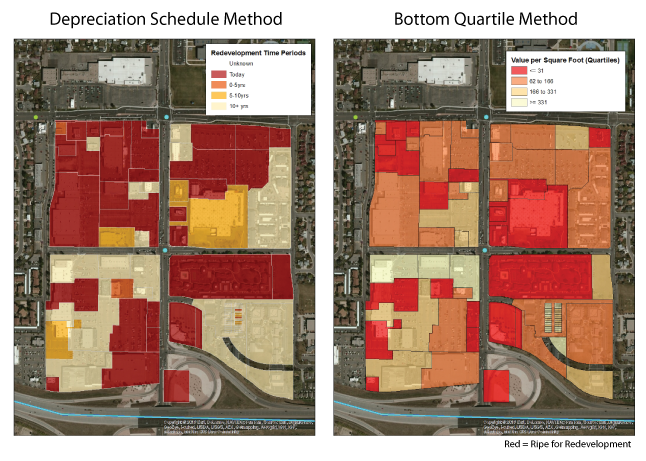 The Bottom Quartile method identifies parcels that have low value compared to other properties in a given area. The app requires GIS data including a non-residential parcel layer with fields for Effective Year Built, Improvement Value, Land Value, Building Lifespan, and Annual Land Appreciation. Field checking the results is very important for a number of reason. Assessor data can be incorrect or have peculiarities in the coding of things like land use. For instance, schools or other civic uses may be coded as commercial uses and thus show up as redevelopable, but in reality the community may have no intention of redeveloping those sites. Depreciation periods differ base on the type and use of the building. Below are some common examples. Generally speaking the depreciation period for commercial buildings is shorter than residential buildings.